The new year has brought out a rejuvenated crop of buyers with renewed enthusiasm, excited to buy homes. Home sales may still inevitably start slow in the first half of the year due to low inventory. Continued drops in the number of homes available for sale could push out potential buyers who can't compete for homes selling at higher prices in a lower number of days, especially if mortgage rates continue to increase. North Texas Real Estate Information Systems recently released their monthly housing market report which cited rising home prices and dwindling inventory. If you can afford it, now is the time to buy! Interest rates are still low, and home prices are still reasonable. 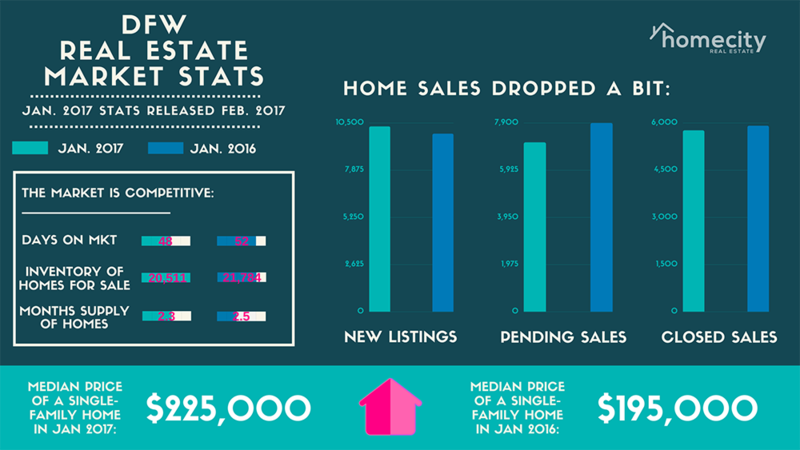 They’re rising rapidly, however, with the median sales price jumping 15.4 percent in January 2017 from $195,000 to $225,000! That’s one of the largest increases we’ve seen recently and should reflect the trend economists predict will continue into 2017. New Listings were up in the North Texas region 4.1 percent to 10,300. Pending sales decreased 10.2 percent to 7,084. Inventory shrank 5.8 percent to 20,511 units. Days on Market decreased 7.7 percent to 48, and month’s supply of inventory was down 8.0 percent to 2.3 months. This indicates that demand outpaced supply and the market will be extremely competitive. Particularly in the most desirable areas of town, be prepared for multiple offer situations. Having an experienced agent by your side is more important than ever when purchasing real estate in Dallas and the surrounding areas. Dallas real estate is a hot commodity, and buyers will want to ensure they have the most experienced agent in their court. In other recent real estate news, those who have FHA mortgages missed out on a cut to mortgage insurance premiums. The proposed .25 percentage point rate cut for loans backed by the Federal Housing Administration (FHA) was removed, setting the scene for what should be an interesting presidential term for real estate policy. FHA loans tend to be a favorable option for those with limited financial resources. This would have saved the average FHA taxpayer hundreds per year. On a brighter note, wages are on the uptick for many Americans, and unemployment has remained stable. This will provide a great environment for home purchasing in the United States, especially in the DFW area. The only hurdle to overcome now is the lack of inventory and we will have the makings of an incredibly strong housing market!